Now, you might be thinking that the words “Winter” and “Camping” look a bit odd right next to each other, but actually, many people love Winter camping, which traditionally has required a lot of careful preparation, but allows you to experience a whole other side of the Rocky Mountains’ majesty, a particularly peaceful side. With a camper van, the required preparation is less stringent, as you’ll have access to a warm, cozy, heated enclosed space. This means that van camping makes Winter camping more accessible to more people. Here are 3 key elements of Winter camping in a van. Naturally, camping in the Winter requires a different set of supplies than Summer camping. You’ll certainly want to bring layers, warm socks, thermal underwear, and one good down coat. Hand warmers isn’t a bad idea either, as these can be put in both your gloves and your boots, in case of extreme cold. That being said, while it can be nice to have expensive gortex clothes made for Winter, it isn’t absolutely necessary. People have been surviving in the cold for a very long time, and with enough layers, fire, and of course a campervan, you’ll be fine, as long as the cold is not too extreme. You’ll also want to bring your Winter recreational equipment, whether that means skis, snowboard, sled, snowmobile tow-behind, or simply snowshoes. You’ll definitely want to bring snowshoes at the very least, as the snow depths in Colorado can be waist-high, or higher. 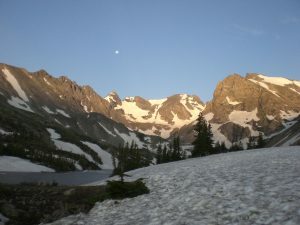 If you choose a location that offers rentals, which many national parks in Colorado do, you may not have to worry about this, as even snowshoes are often available for rent. Also, don’t forget the snowchains! Although if you rent from us, these will be included. When camping in Winter, this is a very important guideline, and your packing should also reflect it. Wet feet, hands, or anything else can put you at risk of getting frostbite in extreme conditions, or simply being cold and miserable. That’s why as many of your layers as possible should be water resistant, and certainly your boots should be waterproof. At the very least, your outer layer (coat, snow pants, boots, gloves, and hat), which are what you’ll be wearing when the weather is coldest, should be very water resistant. When you’re hiking in the cold, it’s best to remove layers when you start to get hot, rather than allow yourself to perspire, because the sweat does not evaporate away so easily as it does in the Summer, and instead will stay in your clothing, get cold, and sap warmth away from your body. Some places can be treacherous or less interesting in the Winter, while others have a special magic that only comes out when blanketed with snowfall. To make the most of your trip, you’ll want to be relatively confident that you’ve chosen the latter type of destination. While there’s plenty of good information online about this, we have a few suggestions to get you started. Rocky Mountain National Park is particularly beautiful in Winter, and a great place for snowshoeing; the 1.6 mile snowshoe hike to Gem Lake will likely be the highlight of that trip, for you. The San Juan Mountains parks such as Gunnison are ideal for cross-country skiing, and also features cozy mountain town ambiance. Lastly, Steamboat is excellent for skiers, and the huge perk of Strawberry Park Hot Springs is the icing on the cake, allowing you to stay warm in a natural hot spring while catching snowfall on your tongue. I hope that you enjoyed reading our tips for Winter Vanlife, if you’re the type of adventurer who prefers to stay away from the crowd and can appreciate the crystalling placidity of Winter landscapes, we really think this could be the camping trip for you. Its certainly a unique and unusual type of adventure, as far as mainstream camping goes, and with the right preparation, will likely be an experience you’ll never forget.